Do you know a girl or unit that has done something really great? Tell us about it using the Girl Greatness Story Submission form! Three Oakville Youths had a royal good time when Prince Harry took part in celebrating the achievements of the Duke of Edinburgh’s International Gold Award winners at the Fairmont Royal York hotel in Toronto on Sunday, Sept. 24. Joia D’Aurora, Leanne Bishop and Lauren Mau were three of the 150 Gold Award winners. The Honourable Elizabeth Dowdeswell, Lieutenant Governor of Ontario, presented the awards. Read the full story, written by Marta Marychuck, which was featured in the Oakville Beaver. Prince Harry helped celebrate the achievements of 150 Duke of Edinburgh’s International Gold Award winners at the Fairmont Royal York hotel in Toronto, including three youth from Oakville, from left to right, Joia D’Aurora, Leanne Bishop and Lauren Maul. - Grant Martin Photography . Every year, the 12th Ottawa Guiding unit goes fishing with the Ottawa South Bass Masters fishing club. This year, Lawrence Gunther, a fishing enthusiast with vision loss and President of Blue Fish Canada, hosted a hands-on fishing demonstration for the Guides. Accessible Media Inc. was there to share the story with their audience. On Saturday, June 25th Alexandria R. of the 67th Nepean Brownies, along with her Brownie friends and her family, brought her winning artwork to life. Alexandria’s Brownie unit entered the Canada Science and Technology Museum competition which celebrates technology and the arts. Her entry illustrated what science meant to her, personally was selected as the winning design for her age category. The mural, located in the museum parking lot, will remain on display until the museum reopens in 2017. Talia B., a Spark in Sarnia, amazed her mom, her Guiders and her unit by selling 960 boxes of Girl Guide cookies. That’s 80 cases; enough to receive the top award in the Cookie All Stars initiative. She is one of only 3 other Spark aged girls in Ontario to reach this level. In addition to receiving a $250 gift card to Best Buy for her efforts, the unit portion of her sales help to fund a sleepover, a year-end bowling and pizza party and a Sarnia Sting game where the girls got to the sing the national anthem. The local newspaper, the Sarnia Observer even featured her in their paper. When Clara G. of the 21st Guelph Guides heard her father talk about the Special Olympics coming to Guelph, she decided she wanted to make a difference. “My dad is a police officer in Guelph and he is on the Special Olympics planning committee. He talks a lot about the Special Olympics and I wanted to be a part of them too!” says Clara. Clara set up a fundraising page to raise money for the adopt-an-athlete program. The adopt-an-athlete program provides funding to athletes to offset transportation, meals and accommodation costs. By selling her bike and running a lemonade stand, Clara raised enough money to fully support 6 athletes. In addition to her fundraising efforts, Clara helps the special needs children at her school by being a Best Buddy, playing with special needs kids during recess and as a Peer Coach at her school's Special Olympics Track and Field day on May 18th, 2016. Clara received a bronze medal and plaque for her contribution. Lauren, a Girl Guide with the 1s LaSalle Guides, is committed to taking action for a better world. For the last several years Lauren has organized a clean-up at local parks in LaSalle on Earth Day. Each year, Lauren and her family choose a park, coordinate with the town officials to get the necessary permissions and promote their activity in the community. In addition to organizing and participating in the clean-up, Lauren arranges snacks for all those who participate. A couple of months back, I wrote an article, as a Girl Forum member, describing why I stayed in Girl Guides, which was volunteering. Prior to the release of that article, I had wrote to Global News about a project that the Guide Unit that I volunteer at was going to do in the next few months. Little did I know that Global News would agree to have an interview with the unit. First of all, a little back story to our special project. The girls in the unit wanted to sew pillowcases for Sick Kids Hospital because of a story that was close to the entire units hearts. There was a girl in our unit named Emma Humphrys, who was diagnosed with an aggressive form of leukemia. Some of the girls in our unit didn’t even know Emma because she moved on to Rangers that same year but all of them knew her story and the fight that she fought using her determination and strength. Emma came home towards the end of January, part of the transition towards the end with her battle with leukemia and we all wanted to do something to say thank you to SickKids and show our support for Emma. That’s where the pillowcases came in. One of the leaders in our unit made pillowcases for the hospital a few years back through the organization Ryan’s Case for Smiles, formerly known as ConKerr Cancer. The entire unit decided that this would be a good service project, knowing how much of a difference this one pillowcase made for Emma and how much of a difference it made for the other children at the hospital. I decided to contact the Global News segment, Making A Difference, hosted by Susan Hays to see if they would like to cover this event and they said yes! So on March Break, Susan came in with her team and they filmed all the girls helping to make the pillowcases. It was a very eye opening experience, taking various shots and the girls enjoyed the spotlight as well. We had Emma join us for the interview and had the girls helping to cut the fabric and pin it. We also had a representative come in from Ryan’s Case for Smiles to help teach us about the organization. It was something that the girls and the leaders will never forget! Girl Guides has always been for me an outlet to give back to the community and the fact that we were able to share this story with the rest of the world was a very humbling experience. Shopping with a conscience © Ottawa Parenting Times Magazine / Family Media Publishing Inc.
After getting an introduction to fair trade, a group of little girls from Barrhaven will likely view Christmas shopping differently this year. In early November, the 194th Nepean Brownies visited the Ten Thousand Villages Festival Sale for an evening of learning, crafting and shopping at a marketplace of fair trade items from around the globe. The group totalled 30 girls – including 18 Brownies, 10 Girl Guides and two Pathfinders. A group of Barrhaven girls recently discovered the principles of fair trade and the importance of ethical choices in a fun-filled evening of crafting and shopping, writes Sonia Mendes. “Learning about our community, near and far, is an important part of the Brownie program,” said Danielle Stewart, a leader with the Girl Guides of Canada. Ten Thousand Villages staged a large festival sale at the Ottawa Mennonite Church every weekend in November, a tradition that dates back more than 40 years. The hand-crafted and fairly traded products for purchase are made by artisans around the world. All proceeds from the sale are used to support artisans in developing countries – and helps to provide them with much-needed food, health care, education and housing. The event began with a short presentation by Kathy Neufeld, a long-time volunteer with Ten Thousand Villages. Neufeld introduced some of the key concepts of fair trade (see sidebar), and passed around a few products for the girls to look at. Ten Thousand Villages sells fairly traded food items (including coffee, tea, spices and chocolate), toys, instruments, jewellery, Christmas ornaments and more. After completing a worksheet about fair trade, the girls had the chance to make an upcycled craft – a jewellery pouch made out of a coffee bag. But perhaps the biggest highlight of their evening was the chance to shop the festival sale. The items’ careful construction and hand-crafted features were certainly not lost on one Brownie. “I like the toys they have,” she said. “They’re made out of real materials like wood, while other stores just have everything made out of plastic. Her friend was enamoured with the decorations. “I bought a sparkly ornament that I’m going to put on my Christmas tree,” she said. And Brownie leader Stewart said making learning fun for the kids carries more of an impact. “The kids will remember the fair trade logo and point it out to parents and friends,” she says. “They will consider what they heard and, over time, I think it will have an influence on their choices. Ontario Girl Guides would like to congratulate our Guiding sister! 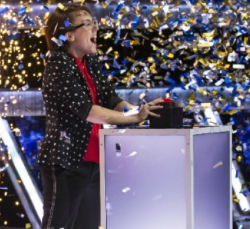 A big congratulations goes out to Katy Warren, a 21-year-old Memorial University engineering student and lifelong member of Girl Guides of Canada, for her big win of CBC's Canada's Smartest Person. Katy is a Unit Guider in St. John's, Newfoundland. Canada's Smartest Person is an interactive television series that redefines what it means to be smart. Contestants battle it out in six different categories of smarts: musical, physical, social, logical, visual and linguistic. See a clip of Katy's final puzzle and her win on the CBC website. Great job Katy! Because everyone deserves a cookie now and then! The 1st St. George Guides and the 1st St. George Pathfinders, along with their leaders, organized a dance-a-thon on April 18th at St. George United Church in support of the Brantford Food Bank. The girls collected 350 pounds of food and raised enough funds to donate 117 boxes of Girl Guide cookies. “The girls really wanted to do this with the cookies because they felt that the kids who are serviced by the Food Bank may not always get treats like cookies and everyone loves Girl Guide cookies! As Guiders we are so proud of our girls and their generous spirit.” says leader Jennifer Haley. Service projects are an important part of the Girl Guide experience. In addition to make a difference in their community, the girls also earned their Event Planning badge and the Community Service badge. This Ranger from Windsor is so great; she got an asteroid named in her honour! Girl greatness starts here! And Candace – a 16-year-old Ranger member from Windsor, is living proof. Ontario Girl Guides congratulates Candace for being chosen to represent Canada at the 2015 Intel International Science and Engineer Fair in Pittsburgh, Pennsylvania which took place in May. Thanks to her aviation-based project, "A Biomimetic Non-Planar Approach to Reducing Induced Drag from Trailing Vortices", Candace is one of only 12 Canadian high school students selected to present at the fair, through a competitive national selection process that began last October. “Candace was pleased that her efforts, along with those of her teammates, helped Team Canada achieve its best results in the fair’s history. She took her role as an ambassador of Canada and Girl Guides of Canada seriously. I am certain that the important life lessons that Candace received from Sparks through Rangers had a part in fostering in her the belief that she could accomplish whatever she set her mind to,” says her mother, Angela. How one girl’s Guiding experience got her to Antarctica! For 16-year-old Alissa, being one of only five students in Canada selected by Students on Ice to receive a scholarship to attend an expedition to the Antarctic in December 2014, has been years in the making. Asked what prepared her for this once in a lifetime opportunity, she gives a resounding answer. Alissa is a Ranger in community 23. She is also actively involved in helping to lead a local Brownie group in her community. As if that wasn’t enough, Alissa is also a member of Girl Guides of Canada, Ontario Council’s Provincial Girl Forum, an advisory group of youth members who provide valued input into Council initiatives. Alissa credits Girl Guides with sparking her interest in social justice. In 2010, right after the earthquake that devastated Haiti, her Guide unit decided to raise awareness by creating emergency supply boxes called "Shelter Boxes" to send over to Haiti through the Red Cross. Alissa is truly living the Girl Guide mission of confidence and resourcefulness and we applaud her for the difference she is already making in the world.